Founded by Isadora Alvarez, Back Beat Rags is a line of laid back, old school California inspired pieces. From breezy, cotton jumpsuits to tees inspired from her own vintage top collection--each piece is as wearable and effortless as the next. While the line itself evokes images of dream-like, lazy days on the coast, Isadora is incredibly tenacious. Having immigrated to America from the Philippines with no connections to pursue a dream, she’s built both herself and her brand from the ground up. Ahead, Isadora walks us through what inspires her and drops some insight for aspiring designers. Did you have an ‘a-ha!’ moment where you realized you wanted to work in fashion? I was 15 and learned how to sew a pair of red pants (I lived in an island in the Philippines and trendy clothing was basically non existent) that I’m pretty sure I saw on Gwen Stefani. I think that really sparked my interest in fashion and I said I wanted to be a designer or have a clothing line one day. Can you talk me through the philosophy of Back Beat Rags? We basically just want to create clothing that you can wear every day of your life that are cool AND sustainable. It's all about the dressing easy to live easy for us! What feeling do you want to evoke in women when they wear your line? Ultimately we just want you to be comfortable, but make you feel good that you still look good and you're actually wearing something that has a lower impact on the planet. How does your heritage influence your designs? I would say more of the environment I grew up in, which was on an island, that influenced me. Everything had to be casual and comfortable because it was always so darn hot! I always preferred materials that are natural because it lets your body breathe. Also, being in an island setting meant everyone was usually dressed in tees and shorts or easy dresses and pants. 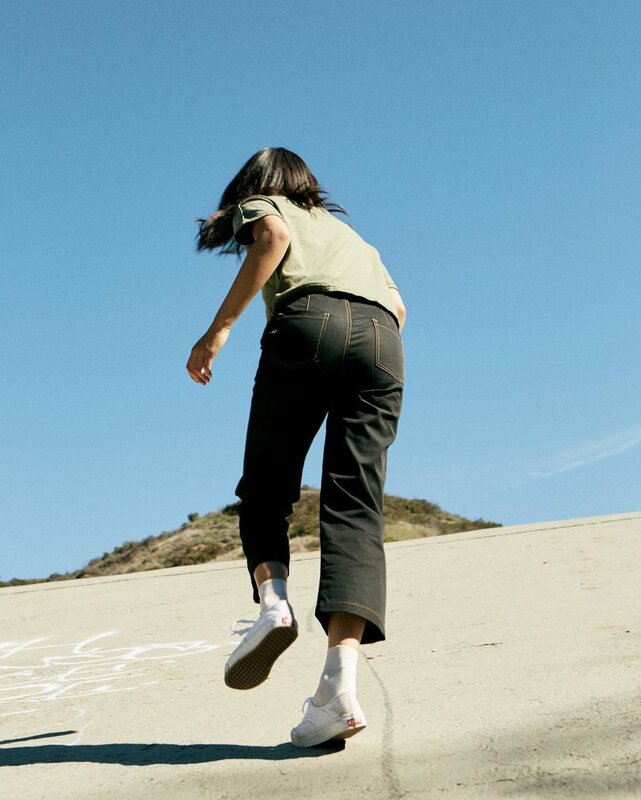 Your line is largely inspired by vintage and old school California surf and skate culture. What draws you to these nostalgic themes and motifs? I was always obsessed with California. I guess it was all the movies and MTV that I watched when I was a kid. There's just something that's innately cool about vintage Cali culture--it seems like it was all free and easy during those times. Hanging out at the beach, skating along the boardwalk, surfing, finding empty kidney shaped pools to kick it with your friends...don't we always wish life's like that? Growing up Filipino, we definitely have a shared experience of being told to follow the most secure career path no matter what. Although professions in the medical field are admirable, there is also value in taking risks. What is your advice to aspiring designers, particularly those wondering if they should just go for it? Life is so short, man. If you can do it, why not? You don't want to have regrets when you're old. I always said--if all else fails I can go back to having a stable job (and obviously there is nothing wrong with having one. Believe me, I miss it a LOT of times) but I want to give this a shot. I also think I am so lucky to be able to have the privilege of chasing my dreams, so it would be a disservice to myself to not try to follow it. BUT with all that being said--be smart about it! Have a plan, ask around, find a mentor, work for a company that's similar to what you wish to have. Do your research, make a budget, scare yourself with the amount of work that you think it will take because it actually takes much more work than you can ever imagine and you need to be prepared for that. I went into this not knowing a lot and on hindsight, I wish I knew more so I could've saved myself from a lot of mistakes. What does your creative state look like? Are you someone who creates prolifically or someone who likes to focus in on one particular project? I am so scattered! I have millions of ideas and I write them down on my notes or take screenshots and then I have about a million anxiety attacks about all of them and what to make, what colors to pick etc. And then one day I just buckle down and work on all of them and somehow it all gets done. Lately though, I have been working a lot on streamlining our design and development process now that we are growing in terms of categories and units. The fun messy way of doing it before is just not working if you want to grow, as boring as it sounds. In the future, what spaces and paths do you want to see women carving in the fashion industry? I think women have always had huge roles in the fashion industry, it's probably one of the very few where we outnumber the men! One person, one place, and one thing that inspires you. Peggy Oki, Morocco, Nature's colors. How do you de-stress after a hectic week? A good meal, a good book read preferably on my hammock in our garden, and SLEEP. Instead of Fast Fashion, Shop H.K.M.